I've had some really interesting conversations lately on seemingly totally different topics, with people I consider to be quite different from each other. Yet, a theme word seemed to keep creeping in there to the point that I thought I should take a look at it, and therefore, write about it. The word was "alone". Collins Dictionary describes the word "alone" as an adjective meaning "without anyone or anything else". It would seem that many people, programs, and pursuits strive to find comfort in "being alone". Meditation and other forms of focus teach you to find that sense of "oneness" and that's considered a good place, a goal to be achieved perhaps. Often we can't wait to "be alone". I doubt there's a parent alive that hasn't at one point or another truly craved "just 5 minutes all alone". I started asking people what the word meant to them. At this point, they probably wished I would "leave them alone", but I kept my queries to those within my comfort zone and they tolerate me. It started to sound like maybe the push/pull feeling we have about "alone", might have something to do with choice. If we choose to be alone we seem happy with that, but if we don't make that choice and instead it happens to us, then we might feel unhappy or fearful about that. We might choose to walk away from the herd to think our own thoughts or keep those really juicy berries to ourselves. But if the herd throws us out because we are unique thinkers or hoarding the good stuff, we're sad, fearful and vulnerable? Interesting, because at a great philosophical presentation a few days ago, I heard reinforcement of the idea that we humans "choose" everything we feel. I believe that to be true. I think deep down, most people do. I remember trying to teach that idea to paramedics in the early 90's. At that time it was part of conflict resolution training. Emergency Responders that are really good at dealing with emotionally charged situations intuitively understand that concept and work with it. It's a hard thing to teach, but once you've experienced enough of the world, in my opinion, it's pretty hard not to believe it in order to survive. Being alone and feeling good about it is a balanced Water Violet state in the world of Bach Flower essences. Today's picture is a Water Violet plant. These plants, and people, are beautiful, gentle, quiet and refined. They lead their lives with precision, clarity and purpose according to Julian Barnard in, Bach Flower Remedies Form and Function. 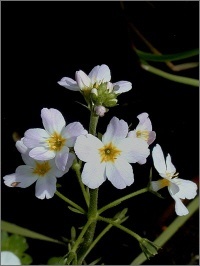 The Water Violet plant grows in pure water, and floats freely without roots. They are submerged for much of their lives. Barnard writes that withdrawal from land to water is a symbol of transition to a higher plane of being, not just a desire for peace and solitude. He writes "these souls are older and wiser than the rest of us". But we live in the world. Every once in awhile the water gets murky, something jumps into the pond that we weren't expecting, or toxins build up to the point that the water is polluted. It's not all negative. Sometimes the peepers come along and their song sounds like a good party. http://pixiedusthealing.blogspot.ca/2011/05/animal-signs-spring-peepers.html The challenge for Water Violet types is to be part of the world and to share their wisdom with others. When they do feel the need to be part of the world they often feel alone and lack resources and relationships that make them part of the bigger experience of the journey. A few drops of Water Violet can help you develop warmer relationships with the herd so you can be a part of something if you choose. If you appreciate and often choose to be alone, but sometimes feel alone, Water Violet would be a good match for you during those unbalanced moments. But if your sense of "aloneness" feels stronger than that and has moved into the feeling of abandoment, Sweet Chestnut might be a better match. If you believe that part of the journey is to experience what it's like to be connected to others and part of something bigger, loosing the sense of connection can be devastating. If your goal is to understand what makes you unique enough to contribute to the collective, and you loose that feeling of connection, you no doubt will experience true and extreme mental anguish. It can be really tough to find your herd. If you did think you had a herd and you found yourself leaving or being forced out, it can be a pretty scary experience. That's what Sweet Chestnut can help with. It can help you lift your head up and realize there is more of a world out there. It can help you realize you chose to leave, or at least to feel this sensation of abdandoment for a reason and you can move on. Sweet Chestnut can help you realize that although you might choose to feel alone, you can never really be alone. It helps you connect with your inner power so you can face the world with optimism and peace of mind even though external circumstances may not have changed. Once you can find the intense joy of being alone, you might just find yourself ready to feel your way back to the collective. Here's to balanced being no matter what you're feeling.